Some say he can smell corners. Some say his teeth glow in the dark. He is The Stig. He drives like a demon – faster than anyone! He exists for one reason alone: to wring every last drop of power out of every car he zooms around the legendary Top Gear test track. In this book, The Stig gets his gloved hands on 30 of the world’s top high-performance cars, and puts his booted foot down on their accelerators. But which car has the grace, speed, manoeuvrability and power to be king of the power laps? This book includes 200 stickers and comes in a nifty plastic sleeve with pounding colour photos on every single page! Design your own super cool supercar! 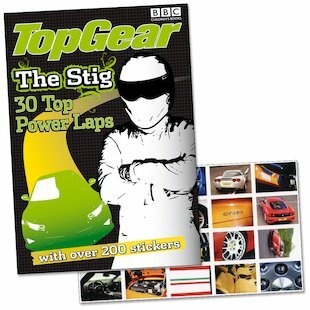 it has great cars and 200 stickers.it is full of facts about the stig.my favourite car is the ferrari 360 cs. THIS BOOK IS REALLY COOL!